During the war, German women filled the labor shortage by doing many jobs that had previously been performed by men – they worked, for example, as streetcar drivers. But even after the war's end, the labor shortage in the Soviet occupation zone/GDR remained acute because of the mass exodus to the West. This shortage was not remedied by the arrival of expellees from the Eastern territories since the majority went straight to the West and those who did stay in the Soviet zone often moved to the West after 1949. 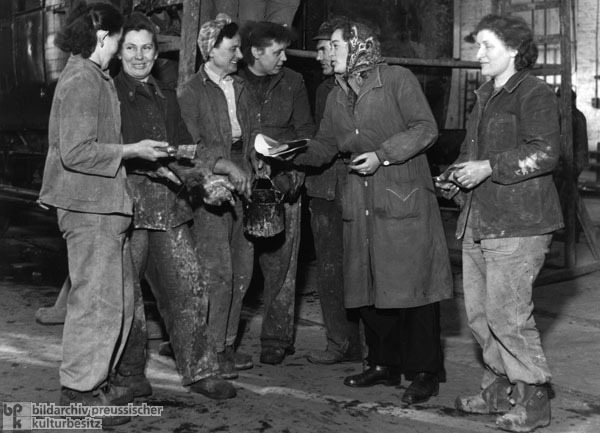 Together with the socialist belief that women’s employment promoted women’s equality, the labor shortage in the GDR led to greater efforts to integrate women into the workplace. Between 1952 and 1960, the number of women in paid employment in the GDR increased from around 3.12 million to over 3.5 million. The number of women working in the public transportation sector rose from around 72,500 to approximately 80,800 in the same period. Photo by Hildegard Dreyer.